Outsource2india enables all your architectural drawings to be easily archived, retrieved and made accessible by converting your paper or image files into AutoCAD drawings. 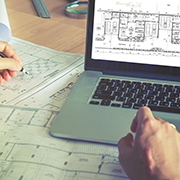 By digitizing your architectural plans, we help you reduce costs, optimize time, and increase profitability. As a pioneer architectural drafting and detailing CAD services provider, we come with core industry experience, advanced technical know-how, and a global delivery model. Outsourcing architectural drafting and detailing allows you to concentrate on creativity and implementation as well as other major revenue generating activities while we work as an extension of your in-house team. Outsource2india is an ISO-certified global CAD design and drafting support services provider with a growing list of clientele including several Fortune 1000 companies. With our superior architectural services, consistent and accurate drawings, timely delivery, and competitive pricing, we have been a go-to service partner to our clients. We offer the most reliable computer-aided design or CAD drafting expertise to work for a wide range of projects for Residential, Commercial, Industrial, Healthcare, Educational requirements etc. of varied scale and volumes. We also offer detailing (CAD) and architectural drafting services, such as concrete reinforcement detailing, rebar quantity estimation and detailed placement drawings. Our team of architects can create drafts in the software of your choice, from AutoCAD and ArchiCAD to Revit Architecture, MicroStation, or Architectural Desktop. Input and output formats - Our architects can develop accurate CAD drawings from any type of format, regardless of whether it's a hard or soft copy. Even if you do not have a design on paper, we can create a CAD drawing from scratch, based on your measurements and design specifications. After we complete the CAD drawing, we can send it to you in the format of your choice, be it AutoCAD, ADT, PDF, Revit or other image formats. We follow an intricate process to ensure maximum transparency in the workflow and quality. And for that, we take a systematic approach for developing a fully customized solution ideal for your requirement. Why Choose Outsource2india's Architectural Drafting and Detailing (CAD) Services? Outsourcing CAD services to O2I can free your in-house staff to focus on other core functions while our team takes the responsibility for developing technical CAD design using sophisticated software housed in our infrastructure. Outsource2india has 20 years of experience in serving customers with top-quality architectural services. Our team of expert architects, drafters, and engineers carry decades of experience in developing rich architectural CAD design. Our CAD services can be availed at most affordable rates in the industry straight from our global delivery centers. We can also work as an extension of your team, if required. Give your business the competitive edge it deserves with our architectural drafting and detailing Services (CAD). Get in touch with us today!